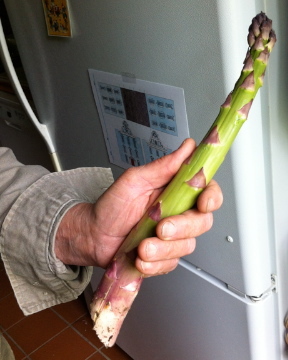 Now that is an asparagus spear! I had wanted to plant asparagus for years but never thought I would still be there when it would be time to harvest. After being here for five years it was time to just do it! The asparagus roots from Johnny's Selected Seeds were planted in 2010 in two beds. They have been pampered with compost, chicken manure and salt marsh grass. Last year we ate one piece. This year we have been repaid for our efforts by having enough to even share a bit!